Welcome to my first post on Love Lines, a blog I dedicate to all the wonderful romance writers who bring their readers so much pleasure and entertainment. Like many of you, I have an enormous store of books, overflowing from book shelves and even busting out of my Kindle, if such a thing is possible. I have decided to review and share them as it is such a pity to keep good news to oneself. 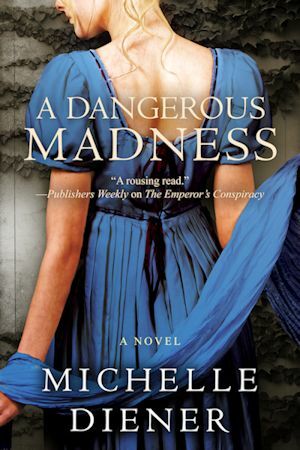 My first review is Michelle Diener’s delightful sweet Regency romance, A Dangerous Madness. It’s beautifully written and combines romance with adventure in a story in which Michelle skilfully blends fact and fiction when Miss Phoebe Hillier and James, Duke of Whittaker get caught up in the conspiracy surrounding the assassination of British prime minister Spencer Percival in May 1812. I love learning about history through my fiction, and Michelle has obviously done a great deal of research around the only successful assassination of a British prime minister. Spencer Percival was a man with many political enemies and investigating each group against a tight deadline provided fascinating insight into England’s domestic politics during the Regency. However, the history never interferes with but rather compliments Phoebe and James’ growing romance. James has a reputation as a dissolute Duke, one he has cultivated at great pains to allow him to penetrate circles no respectable person would be seen in – or trusted in. Phoebe is 25, in the care of her aunt, and engaged to a man she does not like. However, when Lord Sheldrake jilts and makes a run for the continent, he not only threatens to ruin her personal standing in the ton but also puts her life in danger as his connection to the plot to assassinate the prime minister is revealed. Although he is initially not sure if he can trust her, it is up to James to save her life. Aside from the history, there were a couple of things I particularly liked about A Dangerous Madness. The dialogue between the two protagonists is witty and the romance underlined by growing admiration and desire. The heroine has courage and the hero … well, I do love a grown up, emotionally mature and chivalrous hero. A little part of me will always be in love with the Duke of Whittaker. Further, the book came in the most beautiful paperback edition which I will treasure. It is also available as an ebook. Michelle has two other Regency romances, Emperor’s Conspiracy and A Banquet of Lies as well as a host of other books. She writes in two genres, historical romance and science fiction/fantasy, and I look forwarded to reading more of her work. This entry was posted in historical romance review and tagged A Dangerous Madness., book review, historical romance, Michelle Diener, Regency romance, romance author, sweet Regency romance on August 20, 2015 by lauraboon2014.